. 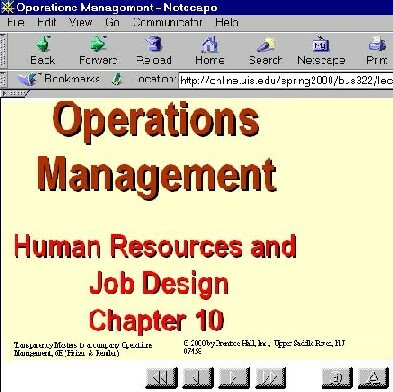 In the official course outline for BUS 203, Chpt 7 is not included. Chpt 7 discusses SWOT analysis, which in the opinion of Prof. Richardson, is important to understand in the context of our GOPST discussion, therefore we will cover the material in Chpt 7 that deals with SWOT. If the measurable Objectives of an organization can be achieved, then the Goal is accomplished. The best way to achieve the Objectives, is with good Plans. 1. Organizational strengths--skills and capabilities that enable a firm to conceive of and implement its strategies. 2. Distinctive competencies--strengths possessed by only a small number of competing firms. Firms that exploit their distinctive competencies often obtain a competitive advantage and attain above-normal economic performance. 1. Organizational weaknesses--skills and capabilities that do not enable a firm to choose and implement strategies that support its mission. 2. A firm has a competitive disadvantage when it is not implementing valuable strategies that are being implemented by competing firms. 1. Organizational opportunities--areas that may generate higher performance. 2. Organizational threats--areas that make it difficult for a firm to perform at a high level.
. Just like many business terms you will have studied before, there is the fancy way with big vocabulary, and the simple way, of explaining particular terms. "the act of choosing one alternative from among a set of alternatives"
a simple way of expressing this would be simply "picking the best from many"
if you don't take action, then it is not a decision, just an "opinion"
1 . Interacting groups --most common form of group decision making. It occurs whenever an existing or newly formed group is asked to make a decision. 2. Delphi groups --used for developing a consensus of expert opinion. The Delphi procedure solicits input from a panel of experts who contribute individually. Their opinions are combined and averaged. These results are fed back to the experts and the process continues until a solution is reached. This method can be used to make group decisions when members cannot attend a meeting. It is a method for gathering systematically written judgements from members using a set of sequentially modified questionnaires interspersed with summaries of results from previous rounds of information gathering from members. The technique was developed by the Rand Corporation as a way of forecasting future events of national and international importance . The technique takes considerable time and effort to complete. In using it, members of the group may not know the other group members and it requires a central co-ordinating mechanism to manage the alteration, transmission, and summarisation of questionnaire data. Each group member independently and anonymously records comments, suggestions, and solutions to the problem facing the group. Each member receives a copy of all written comments from other members. Members generate feedback on other members' comments, and all second-round feedback is written down and sent to the centrally-located individual. The Japanese version of the Delphi Technique is "ringi sho"
"The system for formulating decisions at the lower or middle levels of Japanese companies involves the preparation and circulation of a ringi-sho, or roughly a "project proposal." Under this system, after informal discussion of a proposal, which may involve various levels of management and other employees, an individual or group within a section takes the initiative by writing it up in ringi-sho form. The proposal is then circulated among interested parties, usually accompanied by a verbal explanation by one or more members of middle management. After careful discussion among all the interested parties, various modifications are proposed. When all parties reach a consensus, the appropriate persons affix their seals to the ringi-sho and it is sent to those responsible for making the final decision." 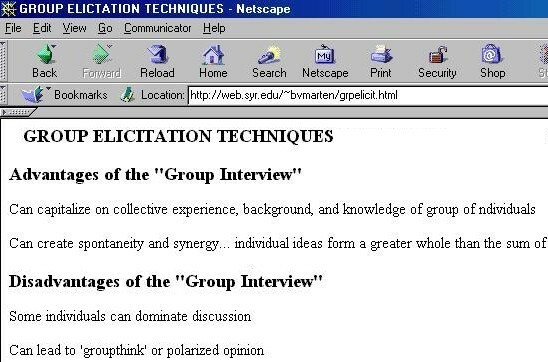 also called Nominal Group Technique (NGT) --an informed group of participants who write down as many alternatives as they can think of. These ideas are listed on a board in round robin fashion. After the ideas are listed, they are discussed. Then the members vote on the alternatives, and the highest-ranking alternative is selected. The leader goes around the table and asks each participant to read one idea from his or her notes. This idea is recorded in some way (computer, flipchart, video tape, etc.). In a round-robin fashion, all participants present their ideas for recording until all are shown. Each idea recorded is discussed in the order it appeared. The leader reads each item and asks the participants if there are any questions or points needing clarification. Each member records the ideas on 30 × 50 cards and rank orders them secretly from `1 to n´. The mean average rankings are used as a basis for the group's decision. The NGT process can end here or the decision may be refined through discussion and revoting. The voting patterns can be analysed and reasons examined to see if more accurate decisions can be made. A final vote is taken in the same way as in step 4. This vote closes the decision loop so members experience closure to the NGT process. 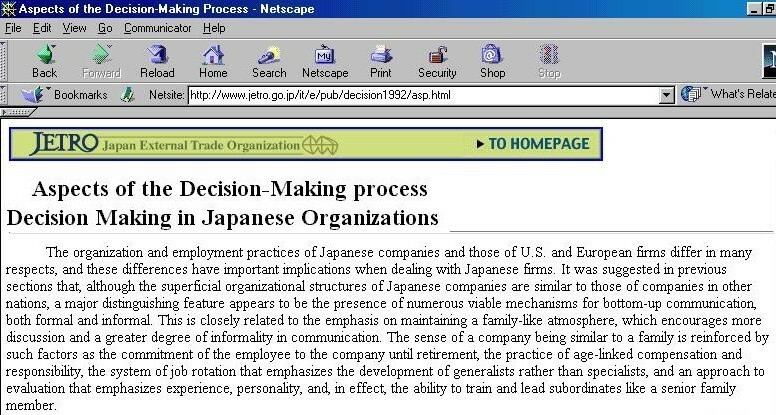 In Japanese companies in the 1970's and 1980's, the process of "nemawashi" resulted in many of the middle managers being able to contribute to the decision making process - which enabled the process to take place - however the drawback was the great amount of time for this process to take place. 1. Perhaps the biggest drawback of group decision making is that additional time and resources are required to arrive at a group decision. In the 1980's and 1990's many North American companies were hampered when they tried to adopt group decision making processes. It is hard to schedule meeting times for groups - there is also a lot of paper work involved and memos back and forth - all of which take time. Also, the more people involved in contributing to the decision, the more likely you will have dissenting opinions, which will take time to resolve. For time sensitive industries, such as commodity trading, or high tech industry, it is a weakness of a company to take too long in decision making since it will allow opportunity for the competition to take an advantage. 2. Group-think, when the group's desire for consensus and cohesiveness overwhelms its desire to reach the best possible decision, can occur when a group is asked to make a decision. One of the curses of political correctness in the late 1990's and early millennium, is the exaggerated concern decision making groups have with their concern for all the possible negative outcomes - which causes them to be so tortured in contemplating these scenarios that they never get around to making a decision at all. D. Managing Group Decision-Making Processes - Managers must be aware of the pros and cons of group decision making. Also, the group should analyze all alternatives critically and allow divergent viewpoints to be presented. It is also a good idea to ask one member to play the role of devil's advocate. An advocate is a word used to describe the process of speaking on behalf of someone. The phrase "Devil's advocate" is used when you have a person speaking on behalf of the opposite position - not because they want to, but because they want to force the other side to deal with challenging issues. In some business situations, we use another term "Red Team". "Red Team" is an expression that comes from the military and refers to the role of an imaginary opposing force, which allows the "good guy" to practice their battlefield tactics and strategy. Many medium and large size businesses and consulting companies have used "red teams" in boardroom discussions in order to challenge a group decision-making process. understanding the dynamics of Group Decision Making is not just for medium and large sized companies, it is also used in advertising when market research companies use focus groups to try to determine interested in various new products and ideas. In this context, the advantages and disadvantages of groups are discussed in a slightly different way. Click on the screen capture below to see an example. 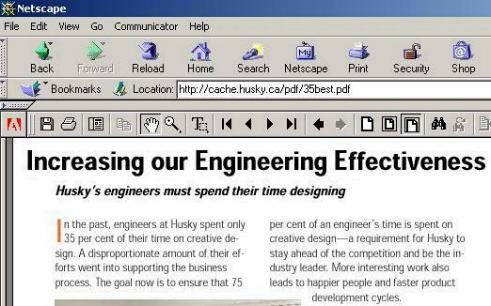 "organizing is deciding how best to group organizational elements [activities and resources]"
"the determination of an individual's work-related responsibilities"
"the degree to which the overall task of the organization is broken down and divided into smaller component parts"
giving the engineers more time to design is not only good for the engineers, but also good for the company since it results in more new designs, which helps keep the company competitive.